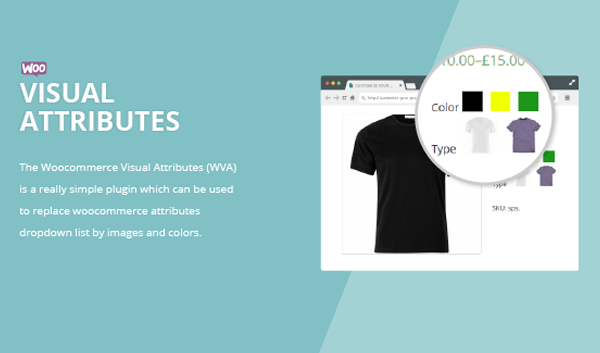 A Woocommerce Addon which replaces the standard product attributes dropdowns by labels, radio buttons, colors, pictures and better dropdowns. Woo Visual Attributes Swatches allows you to customize the look and feel for any variation attribute, dropdowns, labels, radio buttons, colors and pictures are supported. Assign a picture to every variation and let Woo Visual Attributes Swatches change your product picture easily on the product page. Feeling lazy? Woo Visual Attributes Swatches got you covered by allowing you to define quickly the configuration needed for thousand of products in a heartbeat. Woo Visual Attributes Swatches can be used from any computer, any recent browser and any mobile device seamlessly. Woo Visual Attributes Swatches includes a skin editor which allows you to customize every aspect of your attributes to create the perfect look and feel for your shop. Use Woo Visual Attributes Swatches to easily change the look and feel of your product attributes without even going through the documentation included in the plugin. Work seamlessly with woocommerce. No hack included.